БЕЗОПАСНОСТЬ ВЗРОСЛЫХ :: The passenger compartment remained stable in the frontal impact and dummy readings indicated good or adequate protection in all body areas. The knees and femurs were well protected and Skoda were able to demonstrate that a similar level of protection would be offered to occupants of different sizes and those sat in different positions. 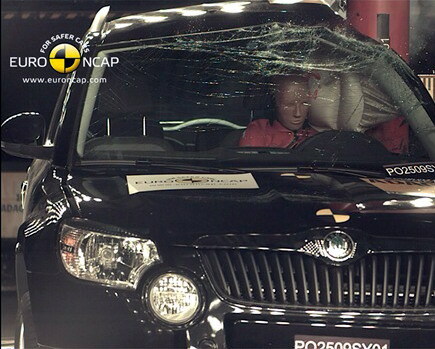 Airbags to protect the chest and the head in a side impact were fitted to the test vehicle. Although they are not standard across the model range, they are expected to be standard equipment in the great majority of sales and met Euro NCAP's requirements for inclusion in the assessment. The airbags helped the car to gain maximum points in the side barrier impact. In the more severe side pole test, chest protection was rated as marginal. Protection against whiplash injury in a rear impact was good. 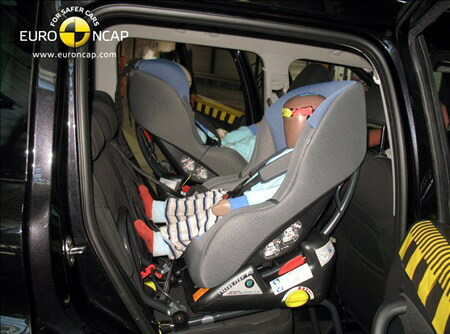 БЕЗОПАСНОСТЬ ПАССАЖИРОВ-ДЕТЕЙ :: Both child dummies were properly contained by the restraints in the side impact test, their heads being protected from possible impact with parts of the car's interior. A switch in the glove box allows the passenger airbag to be disabled so that a rearward facing child restraint to be used in that seating position. The dangers of using a child seat in that position without first disabling the airbag are clearly explained on a label which is permanently attached to the passenger's sun visor. СТОЛКНОВЕНИЕ С ПЕШЕХОДОМ :: The bumper scored maximum points for the protection offered to pedestrians' leg. 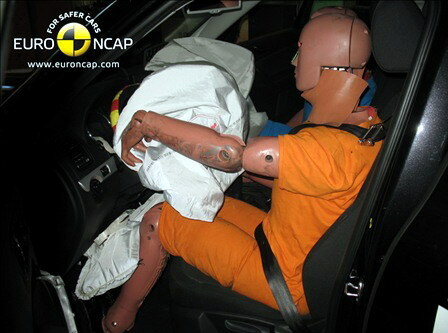 However, tests done outside of Euro NCAP's normal test area revealed structures which gave poor protection. 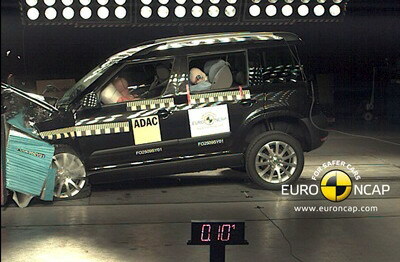 Euro NCAP will soon broaden its test areas so that, in the future, such poor areas are included in a vehicle's score. The front edge of the bonnet performed poorly, scoring no points. Some parts of the bonnet offered good protection to the head of a pedestrian but most areas likely to be struck by an adult's head offered poor levels of protection. СИСТЕМЫ БЕЗОПАСНОСТИ :: Electronic stability control is standard equipment on most variants throughout Europe and is an option on others. 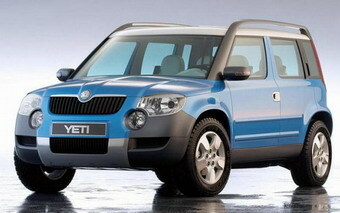 It is expected to be standard equipment in the great majority of sales so qualifies for points in Euro NCAP's assessment. 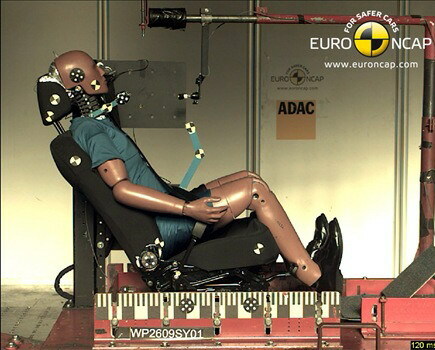 A seatbelt reminder for the driver and front passenger is standard equipment on all variants in Europe.